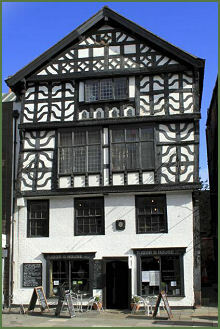 A unique historical building, Tudor House stands at 29 and 31 on the eastern side of Lower Bridge Street. The three storey house was most probably built in 1603, most likely for a wealthy Chester merchant. The plaque above the door inscribed 'This Tudor House was built about 1503 in ye reign of Henry VII' has been proved to be an error, as the building has been dated by dendrochronology (or tree ring dating) to the early seventeenth century. The apartments on the upper floors feature grand fireplaces, oak panelling and wattle-and–daub construction. In the mid seventeenth century the building was extended at the back, in the early eighteenth century Tudor House was made up of 3 houses and as part of a Row, similar to those remaining in Bridge Street today, with a walkway at first floor level. In 1728 it was altered by Roger Ormes, who enclosed the portion of the Row passing through its first floor. The timber framing on the south side of the Tudor House was reconstructed in 1973-74. At street level there are two old undercrofts. One of these undercrofts was formerly used as a bakehouse, the bread oven of which can still be seen, while the other formed part of the Britannia Inn. Other more recent uses for the building include an electrician’s workshop and separate shops for fashion and rare records or collectables. 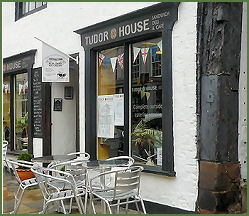 Tudor House, a Grade II listed building, was extensively restored in 2000 and now serves as a delicatessen, cafe and outside catering service.